ONLY BUSH ADJUSTER KITS ALLOWED IN THE V8 RACE SERIES (Holden VE/VF versus Ford FG) Falcon Race Series Australia and New Zealand. FOR SAFETY STRENGTH & RELIABILITY! Lower inner control arm precisely Camber adjustable bushes. K-MAC patented design. Revolutionizing the industry – No more need to disassemble each time and re-position adjustment settings. Now with K-MAC it’s single wrench adjustable on car accurately (under load) direct on alignment rack. Resolves costly premature edge tire wear and improves traction. Track days being able to increase negative camber and track width to reduce understeer, allowing to go deeper into the corners with improved traction, braking and cornering response. Along with improved ability to hit those corner apex’s every time in the pursuit of pole setting lap times! Bush extraction and insertion tubes supplied. FEATURES : H/Duty “Steel” (not plastic encased OEM bearings) for steering loads with Extra H/Duty “Self Align” spherical bearings (PTFE lined). Simply replace existing top strut mounts ( no modifications). Allow for the 1’ST time not just “one offset position of Camber”…. but “precise adjustment” of both Camber and Caster. With the unique K-MAC patented design adjustment system revolutionizing the industry – No more the need for labour intensive disassembly and bush repositioning each time to change alignment settings. Instead precise single wrench adjustment on car, accurately (under load) direct on alignment rack! 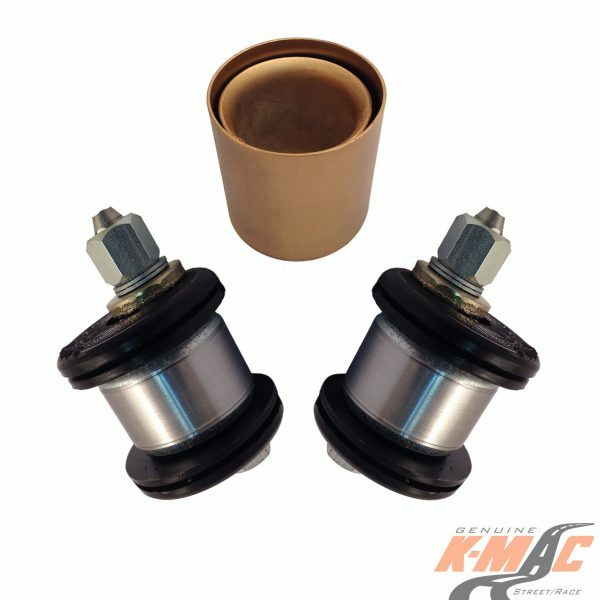 Caster adjustable bushes : Correctly resolving steering pull and allowing improved high speed directional control, quicker turn in and with reduced dive/lift under brake and acceleration. 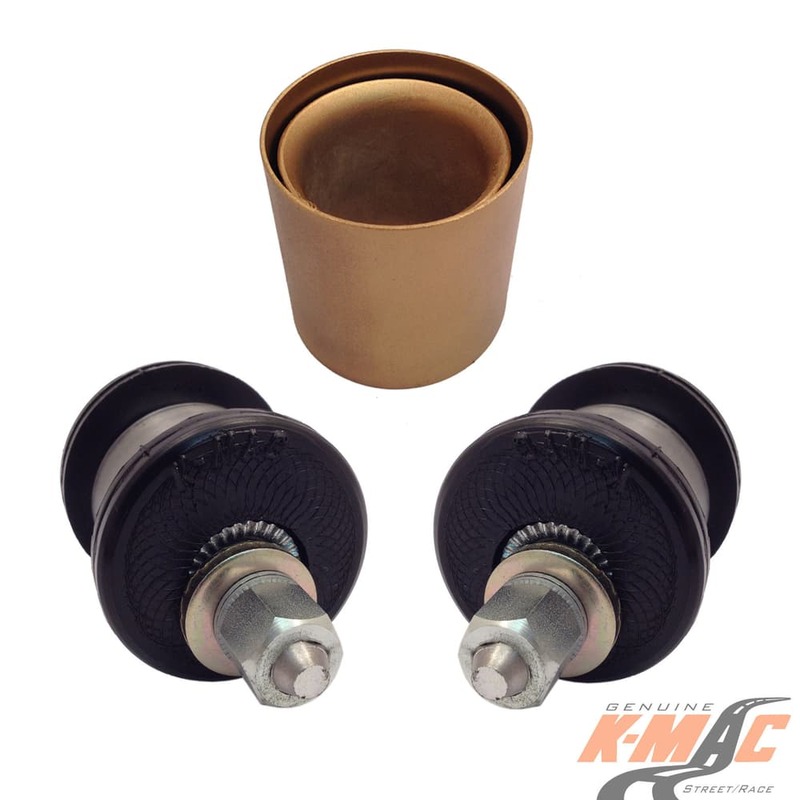 With the Camber bushings Resolving costly premature edge tire wear and improving traction. Track days – Being able to increase negative Camber (and track width ) to reduce understeer , allowing to go deeper into the corners with improved traction and braking response. Along with ability to hit those corner apexes every time in the pursuit of pole setting lap times for race day! 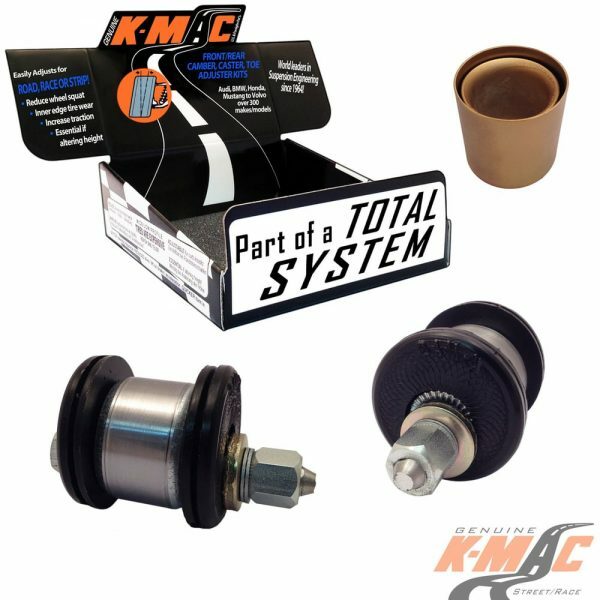 All K-MAC Kits come with bush extraction and insertion tubes.